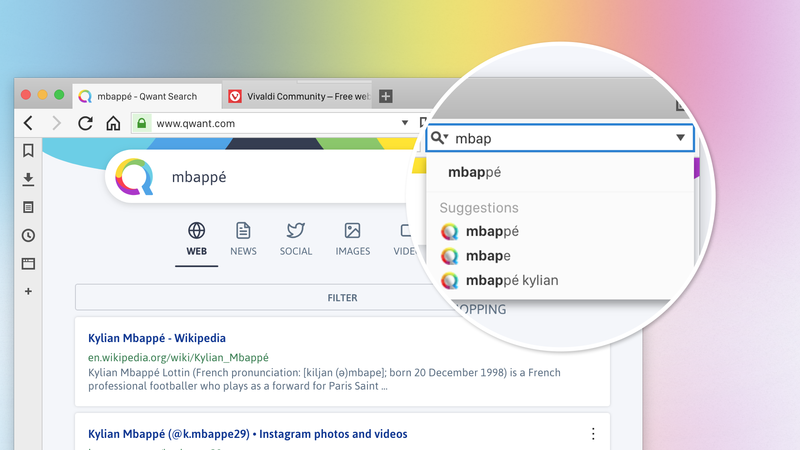 Our latest minor update includes the addition of Qwant as a search option. Read more about our collaboration with the European search engine and get the latest version of Vivaldi below. The Internet, already woven into our daily lives in business and at home, is powerful in its ability to give us access to vast amounts of information. The upsides are obvious. But it’s important to be aware of the potential downsides, and how your choices online influence this system. Many of the tools that help you navigate your way around the Internet utilize tracking to “improve” a user’s experience. But, often, this surveillance is subject to abuse. This story isn’t new. In fact, this kind of surveillance-by-default has become the norm. It’s more important than ever to be aware that your choices online matter. The tools and services you use and support have a very real impact and could very well shape the future of the Internet. With this in mind, we are thrilled to offer our users another privacy-focused alternative that protects you from surveillance, respects your privacy, and promotes neutrality online. 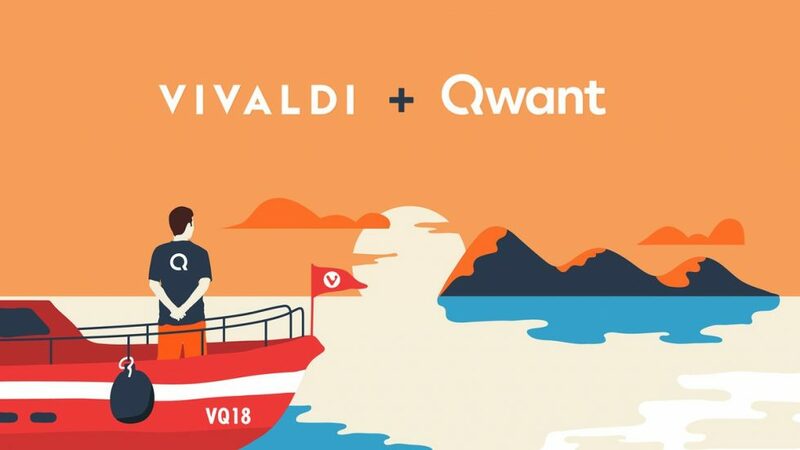 Starting today, we are collaborating with Europe’s leading search engine Qwant to provide a forward-thinking search option to Vivaldi users. More and more, users are seeking out the privacy-conscious option – and we’re proud to offer Qwant alongside DuckDuckGo and StartPage to give users their choice of service. The latest version of Vivaldi will now allow you to search the web without being profiled. In many ways, Qwant echoes our own values here at Vivaldi – they do not track users, nor do they trade in private information. Another important aspect of choosing a search engine is the neutrality of search results. With Qwant, two people searching for the same term will get the same result. Data profiling is not an issue here. 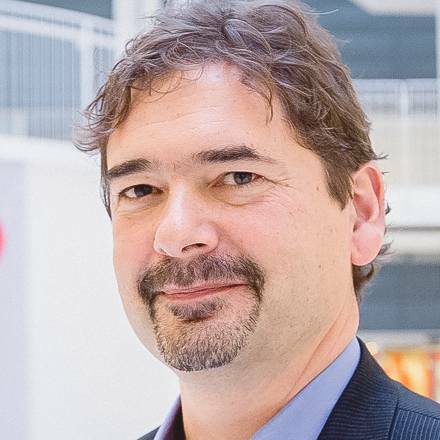 Most notably perhaps, is that Qwant is also the first European search engine that is building its own web indexing technology. We encourage our users to make their choices with clarity and confidence when it comes to matters of privacy and their personal information. If you would like to try out Qwant in Vivaldi, the process is very simple. Users installing Vivaldi for the first time will find Qwant listed in the Search Field to the right of the address bar. Clicking on the magnifying glass icon will reveal a menu of search engine options, including Qwant. It is also possible to search using Qwant in the address field after selecting this option in the Search Settings. 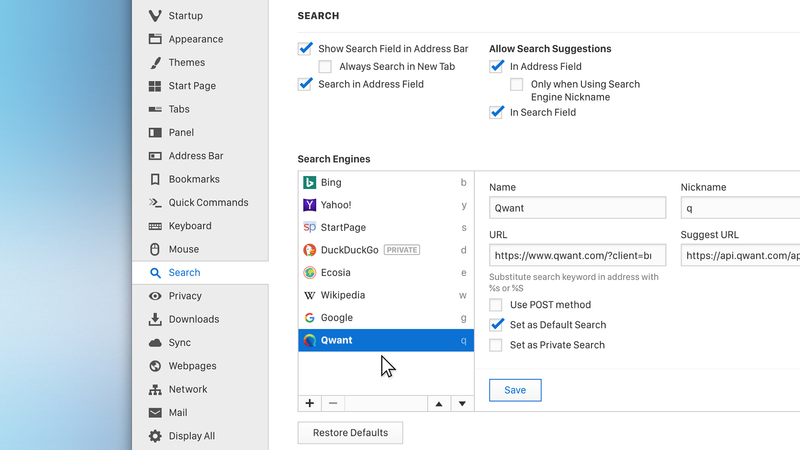 If you are updating Vivaldi and have previously selected a different default search engine, you will need to restore the search defaults in the settings to display Qwant. We’d love to hear from you on our latest update. Go ahead and download it and browse just the way you want! And as always, we’ll continue to add more ways to make your browsing experience dynamic and meaningful. Added Qwant (a search engine that respects your privacy) as one of the pre-installed search engines.